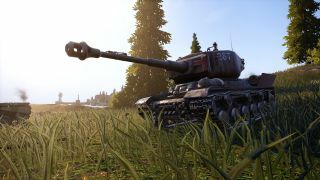 The tank warfare simulator and global phenomenon World of Tanks is getting its largest free expansion to date on consoles. World of Tanks has been a sleeper hit since its first iteration came out on PC in 2010, pitting players against each other in WWII-era tanks with an unrivaled eye for historical accuracy in its vehicle design. In the years since, the series has moved onto Xbox and Playstation consoles, seen a World of Tanks: Blitz spin-off for mobile, reached over 250 million players, and even earned a world record for the most players online simultaneously on one MOG server (Multiplayer Online Game). On June 26, players owning the Xbox 360, Xbox One or Playstation 4 version of the game will have access to the all-new, and free, Mercenaries expansion, marking a whole new stage in the series’ evolution. After the teaser trailer below, we’ve run through the four biggest changes coming to the sim. Mercenaries is the first expansion that's been entirely developed with consoles – and console audiences – in mind. It will be released simultaneously across Xbox 360, Xbox One and PS4, with a new story campaign designed to align itself closer to the faster, action-focused play style of younger and more Western audiences. Since its inception, World of Tanks has been committed to historical accuracy. The design team spend as much time with real tanks as possible, usually attempting to take their own measurements rather than rely on decades-old records, and pore over every detail for their loving recreations. In a series first, players won’t be playing in affiliation to a specific historical nation. In Mercenaries’ alternate timeline, WWII was dragged out for many more years, crippling the finances and resources of the major world powers. As a mercenary in a fractured European continent, you’ll be taking on paid contracts from governments or organizations hoping to lease your firepower; in return you’ll get those sweet, sweet tank upgrades you’ll need to survive in the continent-wide war zone. The series has gradually built on its early foundations to now offer 680-plus versions of tanks in full editions of the game. But there are only so many varieties of tanks made in the mid-20th century, and the alternate timeline of Mercenaries offers wide scope for expanding beyond those restrictions. Faced with increasingly scarce resources, savvy engineers and soldiers have had to scavenge spare parts and piece together their own patchwork tank creations. You’ll find American caterpillar treads or Russian cannons on German panzers, and a huge variety of imagined vehicle combinations that should make warfare less predictable than ever. There’s a clear move towards a more individual player experience, with Mercenaries allowing you to choose between a ragtag team of characters developed in tandem with the new tank designs – this is an expansion that's as much about soldiers in war as it is about tanks. There’s also the option of customizing your own tanks with spraypaint ‘tags’ and toothy designs (above), allowing you to rain cannon fire on your enemies in a machine that suits your own personal style.